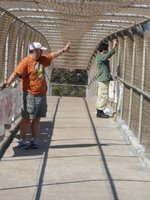 Saturday, October 21st several Friends of Peace members staged a freeway blog (hand-held) on the pedestrian overpass at I35 and 7th street, near Baylor University. Thanks to Robert and Mark for their dedication. 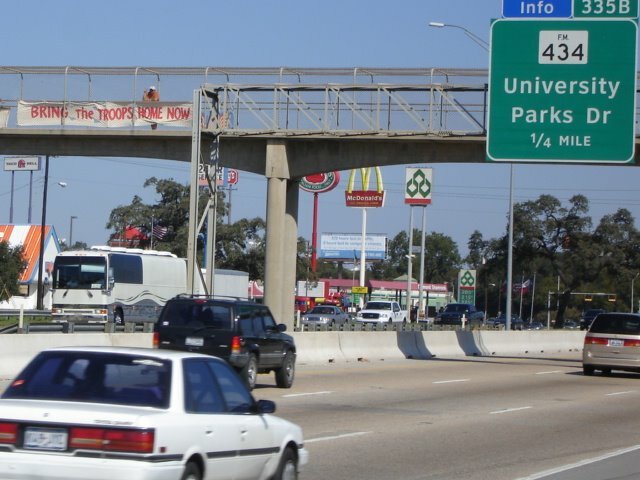 We held large banners facing the north and southbound lanes reading: "Honk for Impeachment" and "Bring the Troops Home Now." The traffic was heavy, with activities at Baylor, and a football game scheduled for 2p.m. The reception was very positive, with MANY honks and only an occasional negative gesture. We were there from 11a.m. to 1:30p.m. 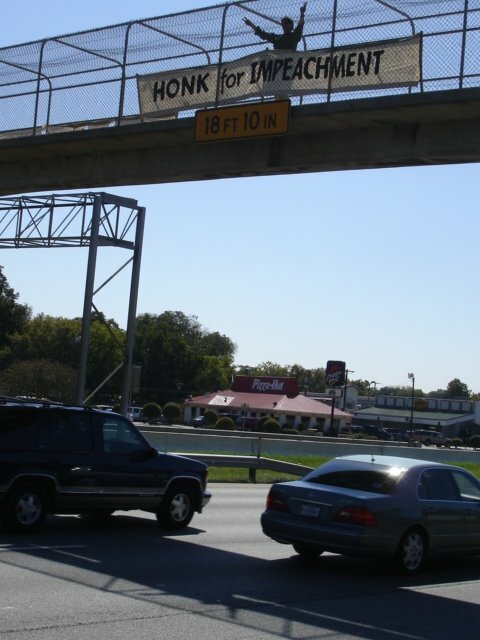 Calculating an average of 65 cars per minute and 2 adults per car, about 40,000 adults saw our message. A tremendous outreach with minimal cost. And a strong statement for those passing through Waco--the last place they would expect to read these sentiments. With the war disapproval rate at 60% and the Democrats poised to control some of the Congress, we feel it's important to continue to speak out. Two local media outlets were represented by photographers, but none of their shots were used--appears to be a blackout by the corporate media, which is feeling the pressure of a likely Republican defeat, and a possible decline in war profits if the Iraq occupation ends. Thursday evening, 6p.m. food service, 6:30 film followed by discussion. All welcome, film is free. Rated R, for language and violence. Iraq war from the veteran's perspective, a story Bush doesn't want you to see. "In November 2004, the Bush administration sent a team to the Ukraine to monitor the presidential election by recording the exit polls. This strategy was chosen as a certain indicator of accurate election results, because historically these polls have been over 99 percent accurate. Yet the same month, as exit polls showed that John Kerry not only won the 2004 election but did so by a significant margin, our government-controlled media pundits, noting the wild discrepancy between the exit polls and the news that Bush had won, could only ask, "How did the exit polls, for the first time in their history, get it so wrong?" Substantial studies of the irregularities in Ohio and other key states have shown that the exit polls in 2004, as in previous years, were amazingly correct. The question that looms next month is, given the fact that every major poll in the nation shows the Democrats significantly ahead, if the exit polls again reflect a Democratic win but the GOP manages to pull off another "miraculous" win, will the corporate media again abjure their responsibility to report the evidence that our democratic process was sabotaged? Or will they ask the right questions this time?" 1. OCTOBER 5, 2006: WORLD CANT WAIT/DRIVE OUT THE BUSH REGIME. The FOP joined over 200 other cities in a protest of the Bush administration policies--particularly illegal war, torture, illegal detention, decimation of the Constitution and Bill of Rights. A nice group of 10-12 of us were at the Valley Mills/Waco Drive intersection from 5 until 7:30 p.m. during rush hour. 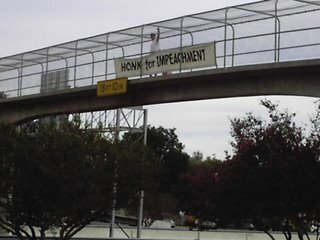 Our banner "Honk for Impeachment" received a very positive response. 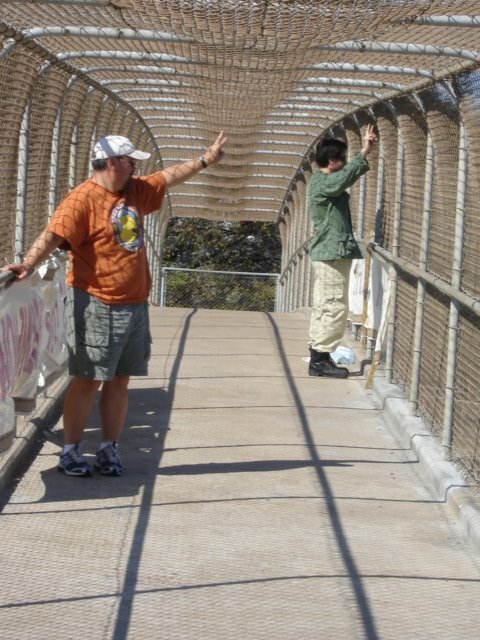 The Waco police attempted to thwart our protest, but we knew our rights and persisted. It was a very successful action. 2. 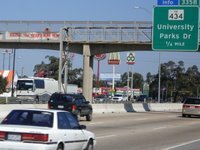 OCTOBER 7, 2006: LIVE FREEWAY BLOG. Two of us held the "Honk for Impeachment" banner in the overpass on I35 near Baylor facing the southbound lane for about 2 hours. 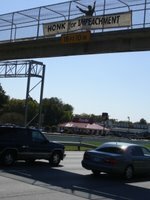 We were stunned at the positive response--nearly constant honking, including 18 wheelers and pickup trucks. This is a first for Waco and a tremendous way to reach a huge audience and raise awareness. We will be back. (See photo above). 3. OCTOBER 19, 2006: "THE GROUND TRUTH." Our film for the month is a documentary about the reality of the Iraq occupation from the viewpoint of the soldiers. A powerful film all should see. Poppa Rollo's Pizza meeting room, 703 N. Valley Mills. 6p.m. food service, film and discussion start at 6:30. Film free to public, all welcome. There is a lot of evidence this may happen, but there is no doubt many bush neocons want it to. The date Oct. 21st is being mentioned. We all hope bush will not create another disaster for the world, but we should be ready to publicly object if it does. Who else in Waco will speak out?